"Words can’t convey how appreciative I’ve been & am for your efforts on behalf of the residents & families fortunate enough to be a part of your homes." "Thank you very much for providing outstanding caregivers who are so generous with their love and kindness, making these months of Dad’s life some of his best." "Your location is magical, but it is the staff who bring the enchantment to El Rancho Encanto. How lucky we are to have all of you in our lives." "El Rancho Encanto was an answer to our prayers for my mother and our family. It truly became her home. 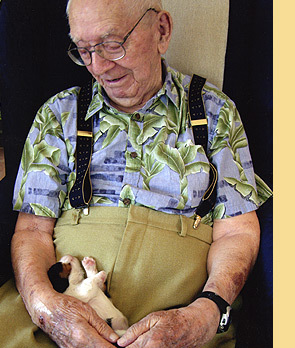 A home that provides loving, intuitive care and many new friends." "We all owe a great debt of thanks to your amazing staff for her rehabilitation." "This is a wonderful place to live. I am so happy to be here and expect to be here for the rest of my life."